Located on a spectacular stretch of white-sand beach, this property features 612 guestrooms, all with hydro-massage bathtub and Riu’s distinctive amenities. The hotel offers an American breakfast buffet, room service and a 24-hour all-inclusive (snacks and beverages) feature plus six restaurants. 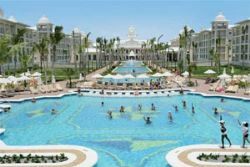 Guests can “stay at one, play at five” at additional Riu hotels within the resort complex. Children have their own pool as well as a mini-club program. All-day buffet dining; Yokohama – Japanese; La Bodega – Brazilian; Luigi – Italian; Grill and steakhouse. Aerobics, Banana Boat Ride (Additional Charge), Billiards (Additional Charge), Body Boarding, Casino (Nearby at Riu Palace Macao), Entertainment, Fishing (Additional Charge), Golf (Nearby – Additional Charge), Horseback Riding (Nearby – Additional Charge), Kayaking, Kids Club, Night Club (Pacha Disco on Caribbean Street), Non-Motorized Water Sports, Parasailing (Additional Charge), Ping Pong, Playground, Sailing, Scuba Diving (1 Introductory SCUBA Lesson in Pool. ), Snorkeling, Swimming Pool, Tennis Court, Volleyball, Water Skiing (Additional Charge), Waterpolo, Windsurfing. Bonus: Junior Suite. All-Inclusive includes all meals, drinks, activities and more. Exclusive $100 Off per booking. $35 spa credit per adult.